Please contact us by phone or e-mail if you have any inquiries about products. We have wholesale and retail sales record of health food, cosmetics, and health-related products for more than 23 years. We sincerely deal with our customers. Please feel free to contact us. Mind Ace is the world’s first water-soluble chitosan. It is soluble in water and easy to digest and absorb. Mind Ace supplies high-purity chitosan. The capsule helps you swallow easily by masking the astringent taste. Take 2 capsules daily, preferably with water. ※The package and design are subject to change without prior notice. ◆Chemically processed shells of crabs and produced chitin. And used deacetylated chitosan. 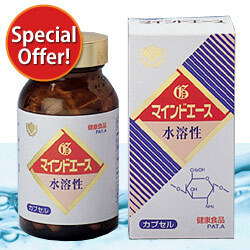 ◆Mind Ace is low molecular water-soluble chitosan and absorption-enhancing product. ◆Consistently manufactured and distributed under a full-scale quality control. Chitosan, extracted from shells of crabs, has various beneficial effects so, therefore it is utilized in many fields such as agriculture, animal industry, fishing industry, medical services etc. Chitosan is originally macromolecule. The low molecular water-soluble chitosan, “Mind Ace” is produced by being poorly-differentiated its molecular weight to render water-soluble. ※Molecular weight above 10,000 is referred to as high molecular, and that below 10,000 as low molecular.